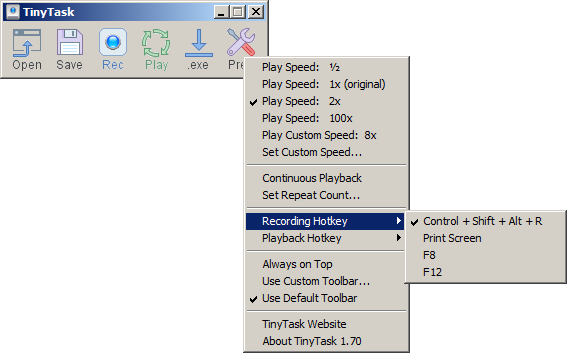 TinyTask is a small, simple mouse and keyboard macro recorder. Anything you do with the mouse or type on the keyboard while the program is running can be replayed as many times as you choose. Recordings can even be compiled into an executable file. Recordings are not editable (perhaps in a theoretical v2). May not record mouse wheel movement on some mice. How to extract: Download the ZIP package and extract to a folder of your choice. Launch tinytask.exe. Issue: If the program does not record mouse clicks, restart. For simple, repetitive tasks that you don't need a big program to fully automate, this can be a surprising time saver. Two caveats: 1. Do not touch the keyboard or mouse while the macro is running. 2. If you want to stop a process in the middle, hit ctrl+shift+alt+P. Very, very happy with it. I was forced to use a custom-version of Breevy that is 100% portable. Note that not all all of these methods will work for every window, so please use whichever one works for your needs. Restore a window by left clicking that window's tray icon, or by selecting 'Restore Window' from the tray icon's right-click menu. Note: The program has no tray icon of its own. 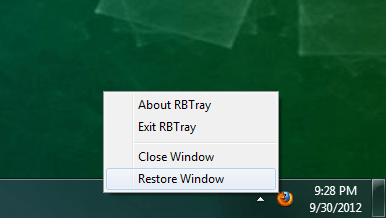 To exit the application, minimize a window, right-click the resulting tray icon and choose 'Exit RBTray'. Alternatively, run RBTray.exe with the "--exit" parameter. How to extract: Download the RBTray.exe and RBHook.dll to a folder of your choice. Launch RBTray.exe. I find I have to double click tray icon to restore, single click does nothing. Using XP SP3. Very useful program. I think the best and more useful that let you iconize on sys tray and set the trasparency of every window just right clicking is still Power Menu. you can use also wintray, which is nice. 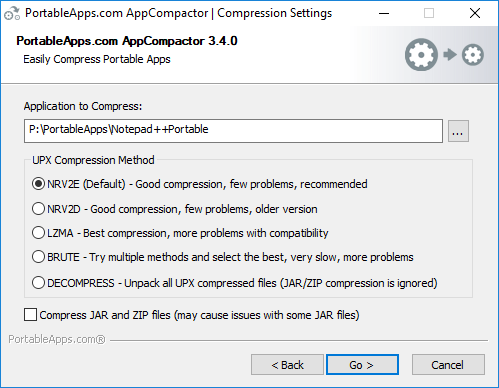 PortableApps.com AppCompactor allows you to compress whole directories including applications, file libraries and zip files. The program is a powerful compression tool that unites 7-zip and UPX inside a user-friendly wizard. For applications, this saves disk space and increases performance when running from a slow media (like flash drives). For archives, this will recompress DLL, EXE, ZIP, JAR, IRC, PYD and BIN files to their maximum compression settings, as well as an option to decompress an app's binary files that were previously compressed with UPX. All files are tested using UPX's test feature after compressing. Files smaller than 4K are automatically skipped as compressing will not save space on the drive. The standard Microsoft Visual C runtimes are skipped to prevent antivirus false-positives. Advanced configuration can be done with apps in PortableApps.com Format. Note: As UPX will alter the EXEs and DLLs (reversible using the Decompress option in the AppCompactor) and some apps may have issues with Zip or Jar files compressed further, users should backup software and test it after processing. How to extract: Download the self-extracting EXE and extract to a folder of your choice. 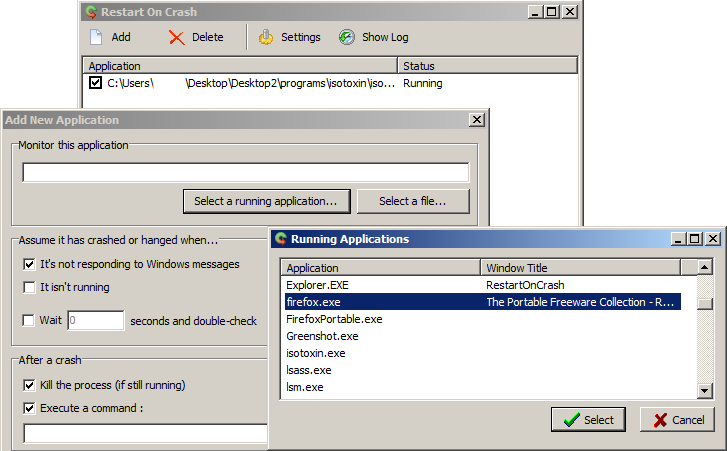 Launch PortableApps.comAppCompactor.exe. Updated to the latest 7-Zip and UPX. tommyD: Disadvantages are that it breaks some programs, and it may be slightly more CPU-intensive to decompress libraries and executables on the fly. I agree with wf; where is operaportable? Binal is a highly customizable binary clock desktop widget. Select color scheme, display position and 12/24 hour modes. How to extract: Download the ZIP package and extract to a folder of your choice. Launch Binal.exe.